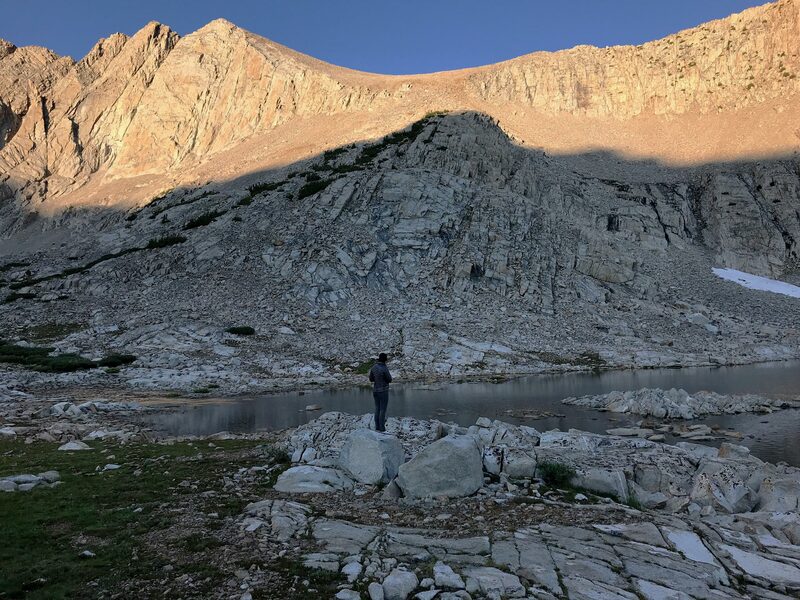 Our day started earlier than the routine set by myself in the subsequent days of my thru-hike but later than a close-to-dawn trekker schedule would allow. Two other parties had already left camp by the time morning ‘duty’ called, which was fortunate because there was no privacy to be found anywhere around this site. We had encamped the night before at this spot, which was about 2.4 miles away from (and a 1,000-foot ascent) the infamous and treacherous ‘Woods Creek Waterslide.’ On the northbound slope, the trail overlooked the mostly clear, open camping ground that reasonably allowed for about five tents to be pitched, although, from the look of it, many more had been erected based on evidence left by previous occupants. Well-spaced trees provided several spots for placement of siliconized nylon quarters, no ground cover to stifle the lateral expansion. To the south, the path crept upon the area providing convenient voyeurism if one was to look up from their downward glance at trudging feet. To the east, far off in the distance, was the raging Woods Creek, where one misstep would result in a not-so-waterpark ride down to who-knows-where across slick slabs of rock and a good bashing into car-sized protruding boulders. This place, the site we called home sweet home for one night, was a repulsive display of exposed feces and toilet paper bombs. The offending parcels were littered everywhere amongst the plots of land that we called ‘campsites’, and off to the edges of the general vicinity behind trees—which the transgressors used to obtain some level of dignity from spying eyes—and steps away where we had eaten our dinner the night before, unknowingly aware of the inadequately dug cat-holes. If you liked camping in a toilet, this was the place to be. In addition to its status as a toxic waste area, it was home to hordes of mosquitos. Oh yes, our little viciously vampirous foes who visited us all too frequently during our 2017 adventure. Grievously, morning movement beckoned and the search for an area to use as a privy ensued. I had thought about this moment all through an anxiety-filled evening—where was I going to go that was acceptable according to LNT (leave no trace) standards, but at the same time offered some level of sequestration? I climbed down to an area where I needed to employ some bushwhacking skills, hacking my way through shrubbery that clawed at me like hungry zombies from a horror flick. Everything seemed to work against my pursuit to find somewhere to do what is essential to everyone and everything else that walks and crawls this earth. I know there are some of you reading who are already thinking, “Does this woman really need to talk about this? 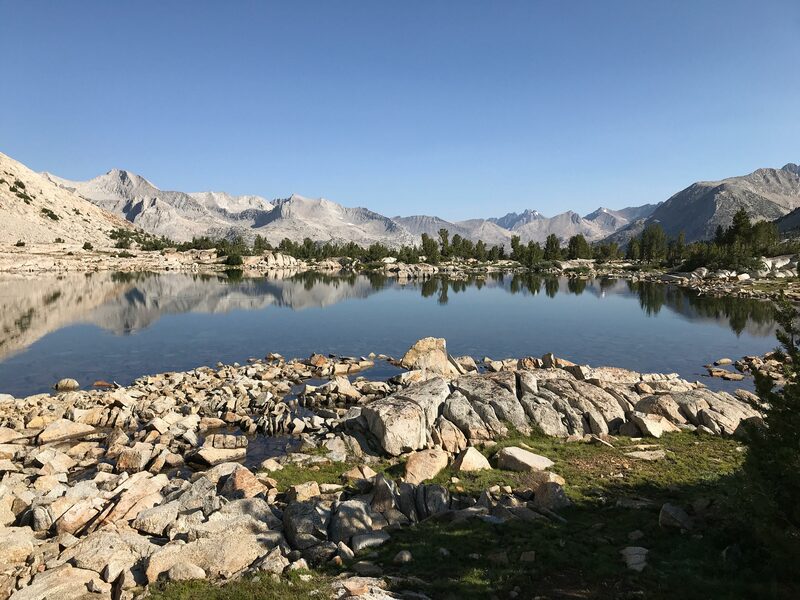 Is all this poop talk relevant to telling a story about hiking the JMT?” My answer to you is, yes—it’s relevant, necessary even because all you do when you’re out in the wilderness on a sojourn is walk, eat, eliminate, sleep, then repeat, day after day after day. I found my not-so-ideal but a meets-all-standards location and dug a more-than-adequate cat-hole thanks to the soft damp soil. Now I could see some relief from pressing matters, but it wasn’t without discomfort—jeez, is there anything comfortable out here? I was being assaulted. A gang of mosquitos, always hungry, pierced every part of my body with their sucking probes—and I mean every part. The onslaught was relentless. As I swatted the ones that were biting at my temples, the others advanced on my nether regions. As I struck at the ones down there, reinforcements came topside again. It was maddening. I hastily ended my transaction, covered the evidence, and returned to the safety of our orange, domed domicile. Soon after, a few hikers had stormed up the hill, and I realized that serendipity took kindly to me because if I had remained where I was, I would have been on display for all to see. After eating our breakfast, we ended up leaving camp around 8:30 am. My husband, Joe, wanted to go earlier, but as usual, we were delayed by the morning routine of doing our thing and packing up the abundance of gear we carry. The previous day was oppressively hot, and Joe had suffered from either heat stroke, dehydration, or both, and he wasn’t feeling 100% today. The trudge up to our next pass, Pinchot Pass, was brutally steep and long. There were a good number of stone steps placed just to break your stride, or so it seemed. It was, again, scorching hot. The sun sizzled any exposed skin, and the warm air dried any moisture from nostrils, mouth, and lungs. We made a number of stops for water so that we would not dehydrate, and we drank like fish, but yet barely made any stops to eliminate water. I thought we were advancing at an agonizingly sluggish pace; however, we actually passed someone who was plodding along slower than we were. It was an arduous climb this day for everyone. I made my way out to the middle of the little oasis, stepping from rock to rock, and sat down on a flat shelf in the middle of the lake. I peered into the water, bewildered by the tiny little crustaceans; they made me smile. Eventually, we made it to the meadows just below Pinchot Pass. The high plains abounded with grass, tiny white flowers, and birds. The birds were chirping, swooping around a small little lake (at this time of year, it was more like a pond) that was filled with little critters that looked like shrimp swimming around in it. We unloaded our gear onto some nearby rocks, and I dug through my pack to retrieve my water filter kit. With a water collection bag in hand, I made my way out to the middle of the little oasis, stepping from rock to rock, and sat down on a flat shelf in the middle of the lake. I peered into the water, bewildered by the tiny little crustaceans; they made me smile. I reached my hand in an watched them flee, and then return, flitting about here and there, probably unaware of how short their minuscule lives would be. This place was so peaceful, and the air had cooled, a refreshing breeze had started to pick up, wafting a fresh scent of rain around us. I felt like setting up camp right there, but we couldn’t. We needed to move on. The clouds were quickly moving in and again, the sun did its dance across the meadow and upon the emerging petrous giants. This time, we donned our rain gear before heading up the pass, we had learned our lesson from previous days. The problem with putting your raincoat on before the rain actually starts is that the physical exertion causes you to sweat inside the water-resistant sheath, making you almost as wet as if you didn’t put the garment on in the first place. 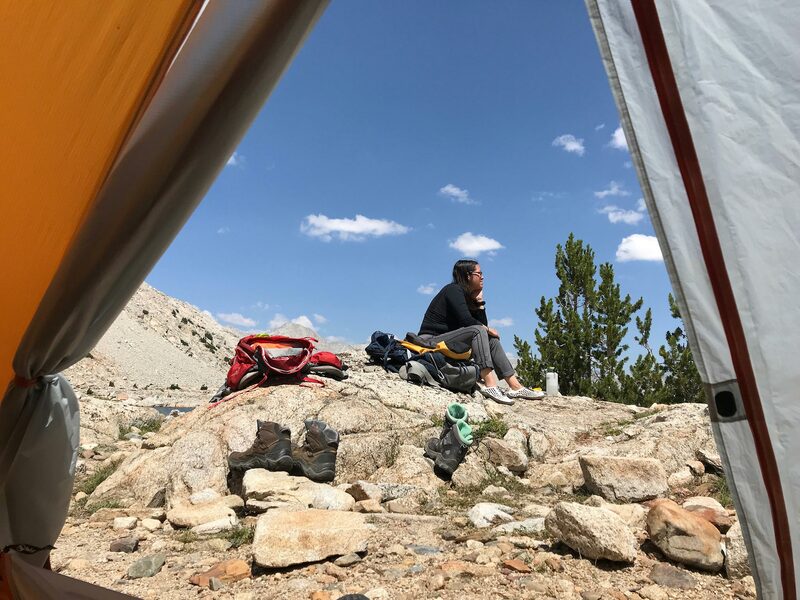 The manufacturers claim that the apparel is breathable, but we all know that has very little meaning when you are strenuously slogging 45+ pound backpacks up hundreds of feet in elevation. We made our way up the rock-lined path leading to the pass that was saddled between Crater Mountain and Mount Wynne hoping that the coming storm would hold off until we reached the summit, but it started to get uneasily windy, and there was thunder bellowing in the distance. We hurried as quickly as we could, but the altitude and terrain prevented us from moving fast. The ascent up the pass wasn’t particularly challenging, the trek all the way to this point was, by far, more demanding; however, since we were trying to quicken our pace, we had trouble catching our breaths, and we needed to stop at every switchback for a breather. The lack of oxygen at 12,000 feet started to make us light-headed, and moments of blackness veiled the sight from our eyes. I was faring a little better than Joe; however, I think my gait was hastened solely out of fear. 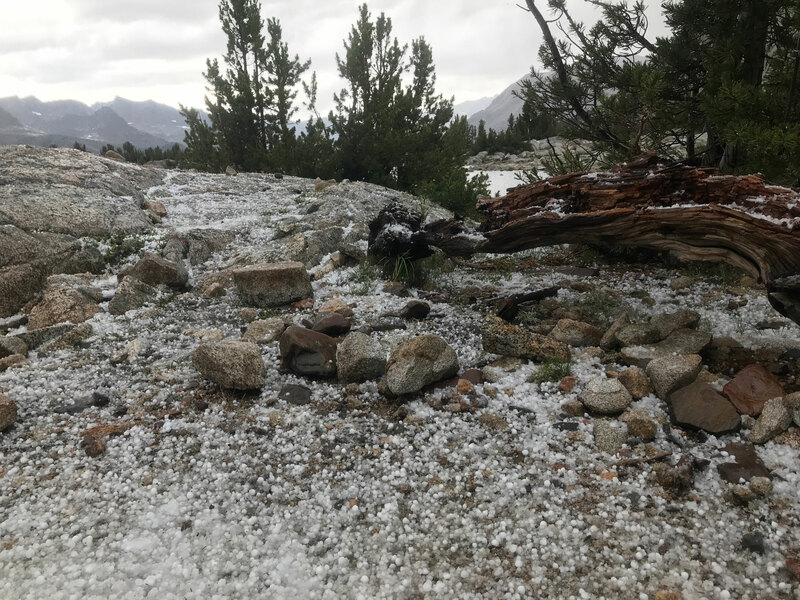 Eventually, we made it to the top of Pinchot Pass, just in time as the wind had picked up considerably and the first few drops of rain had begun to fall. We made our break at the capstone brief, taking a few quick pictures before we descended down the other side, looking like neon sentinels guarding a Tolkienesque realm (our packs were covered with bright orange rain covers). As we made our way down, it seemed we would luck out, what little rain had started, thankfully had stopped shortly after. On our way down, we saw a packtrain on its way up to the pass. We had seen this same succession of man and beast the day before while camped at the ‘shithole’ and I had made a remark about having seen them the day before. 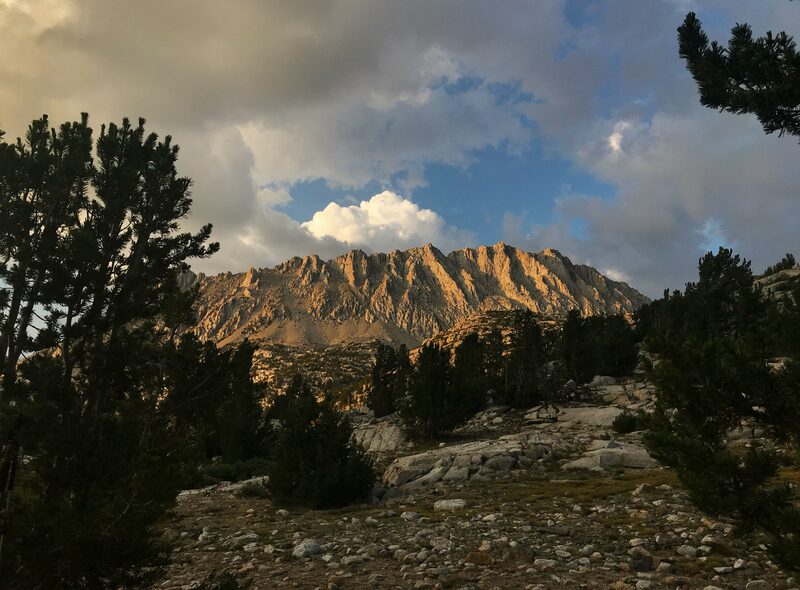 The riders had said that they finished resupplying a trail maintenance crew, a common practice out here as there’s no other practical way of sustaining those who venture out for weeks on end in service of the trail. We had reached our predetermined campsite but decided to proceed past it and push to another one just a mile away near Lake Marjorie. That last mile seemed agonizingly long, Joe with his wide lumbered gait making my stride look like baby steps, I struggled to keep up. The clouds had grown more ominous, and Joe was trying to beat the imminent storm. I cursed him under my breath because I hated when he left me in the dust like that, making me feel inadequate. Everyone says, ‘hike your own hike,’ but something inside me feels that competitive spirit surface and lash out like a child throwing a tantrum. One of my hiking pole tips, the little rubber ones that block the sound of metal on stone and provide extra traction on smooth rock, had gotten stuck and was snatched up by the earth. I was already a few dozen steps away from the scene of the crime before I had realized, the clickety-clack of pole tips striking rocks, giving a clue. Turning around, I walked back to find my little instrument of silence, but it was all in vain. Now I was irrationally annoyed and yelled at Joe to halt immediately. In a wild hunt, I deliriously looked and looked, but it was gone. I had a spare, but at this point, I was illogical and could not be consoled. Moving on, we came upon a site that looked suitable. We started to put up our tent when the skies opened up, beginning to lightly rain at first, but soon followed by angry hail. Trailing along behind the hail, thunder and lightning made their intimidating appearance. By this point, after 2017’s 130-miles, we’ve become efficient in putting our tent up, especially in the rain, and had just finished raising it before the inundation of ice balls started falling from the sky. The storm was a cataclysm, a force so punishing that even the shelter of our tent didn’t feel safe. Piles of ice started forming around our tent, and an accumulation of the frozen pellets started collecting on top of it—we had to clear the ice off to keep our roof from caving in. It was hailing so hard that it was pushing water through the fabric of the tent, making it rain inside. I blew up our sleeping pads while Joe continued to battle with the sagging tent. It was freezing cold; the temperature had dropped drastically, and we were again in jeopardy of becoming hypothermic. We stripped off all of our wet clothes but refrained from putting on our camp clothes out of fear of getting them wet too. Joe and I squeezed into his sleeping bag liner to share body heat and warm ourselves, but that didn’t seem to work. Both of us resigned to putting on our camp clothes although we knew they too would soon become damp, and we had no choice than to take our sleeping bags out of their water-tight sacks to raise our body temperatures. Then we crammed ourselves into his sleeping bag, like an overstuffed sausage casing, and threw my bag over the top of us. After a couple of hours, it finally stopped raining, and the sun actually made an appearance; however, the damage was done. The hail had created a dam around the edges of our tent, keeping the water from draining away and it was percolating in from the floor of the tent making everything inside either damp or wet. Our inflatable sleeping pads kept us up off the acutely cold ground as well as kept us sitting above the water. We remarked how it was going to be problematic to keep our sleeping bags relatively dry through the night because they would inevitably end up touching the waterlogged floor. Our sleeping pads now became rafts, we were floating in a sea of misery. After the storm, we assessed the damage and discovered our tent now stood in a lake of its own. Both of us stepped outside to assess the damage, small white globules covered the landscape but were soon shooed away by the warming sun. I proceeded to cook dinner, 960 calories of freeze-dried macaroni and cheese…comfort food. I ate my meal heartily, enjoying every sublime bite. Mountain House® Macaroni and Cheese was one of my favorite meals with its processed cheesy goodness and belly-filling pasta. Life was again good, with the exception of another group of hikers who set up camp nearby. Finding privacy in the middle of nowhere is more difficult than you would imagine. We’re miles away from anything resembling civilization, and still, we seem to never be out of the line of sight from someone. It’s really annoying and makes bathroom secrecy difficult. The next morning, we slept in until 6:30 am and awoke to a contrastingly beautiful day. 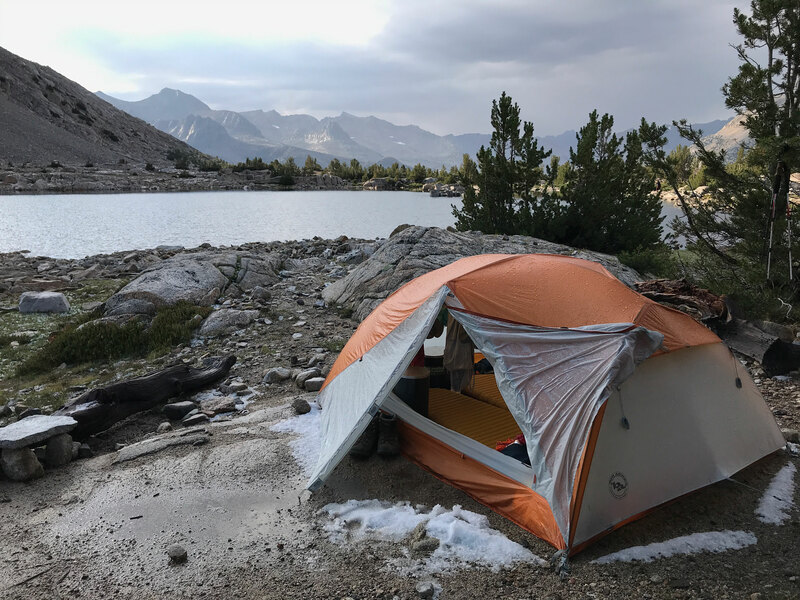 We waited for the sun to come up over the peak behind us and decided to take a zero-day there at Marjorie Lake so we could dry out all of our gear. As the sun continued to rise, it’s warming radiation shone down on us as if to apologize for abandoning us the day before. The water of the lake, like glass, reflected the majestic mountains that surrounded us. I sat perched upon a rock, soaking in all of the glory, and became overwhelmed with the beauty of it all. This was the moment when it all became clear, why we do what we do, venturing miles out to the middle of the wilderness. Yes, life was good. I sit in awe of the beauty of the mountains around me. The sun sets at Lake Marjorie after our glorious on-trail zero-day.